Join Volition as we help celebrate The National Day of Writing on October 20th! Visit us in North Plaza from 10am-12pm. Fall for the Book is this week! Make sure to check out all the great events in the area, especially the ones happening on our very own GMU campus. You can find a schedule on their web site here: http://fallforthebook.org/schedule/ Also, from Wednesday–Friday, Volition is hosting a book swap. Bring a book to donate, and take a book home! We’ll be in the JC Plaza Tent. Do you write poetry or prose? Are you a photographer or an artist? Volition’s Fall 2017 submission deadline is Nov. 3rd, less than a month away! Click here (or see the “Submit” tab above) for submission guidelines and more information. We look forward to seeing the creative work of GMU artists, graphic designers, and writers! On May 5th, Volition will be celebrating its 20th anniversary alongside the George Mason Review in the JC Bistro at 7 p.m. This will be a wonderful opportunity for students to network and unwind during finals week with food and refreshments. We hope to see you there! 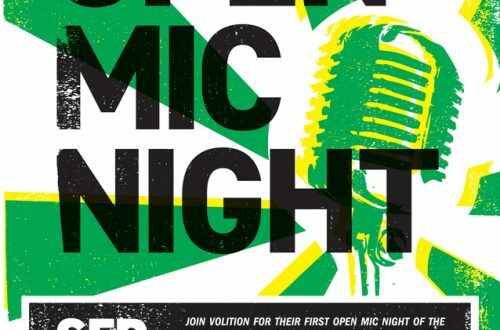 What better way to return after a relaxing Spring Break than to enjoy a night of music, literature, and refreshments at Volition’s Open Mic Night? Our March 17th Open Mic Night will be held at the Bistro, first floor of the JC, beginning at 7:00 p.m. We hope everyone had a great time at February’s event and will show up for even more fun this week! Tune your instruments and polish your short fiction; Volition’s Open Mic Night is occurring this week, Thursday Feb. 25 in the Corner Pocket at the HUB, starting at 7:00 p.m. Come for a night of music, poetry, fiction, and food! More information can be found on our events page, or by talking to us in-person at our JC kiosk sometime this week. And remember, our Spring 2016 submission deadline is March 31st. Haven’t Picked Up the Fall 2015 Issue Yet? If Student Media is just too far away in the brutal Winter cold, but you know you want Volition’s Fall 2015 Issue, then take a look at the IVth Estate stands throughout the Johnson Center! They now also hold our most recent publication.